31mm stainless steel case, domed bezel, black concentric circle dial, Arabic numerals, and Oyster bracelet. 31mm stainless steel case, domed bezel, black dial, Roman numerals, and Oyster bracelet. 31mm stainless steel case, domed bezel, black sunbeam dial, Roman numerals, and Oyster bracelet. 31mm stainless steel case, domed bezel, black dial, index hour markers, and Oyster bracelet. 31mm stainless steel case, domed bezel, blue concentric circle dial, Arabic numerals, and Oyster bracelet. 31mm stainless steel case, domed bezel, blue dial, index hour markers, and Oyster bracelet. 31mm stainless steel case, domed bezel, blue dial, Roman numerals, and Oyster bracelet. 31mm stainless steel case, domed bezel, pink dial, index hour markers, and Oyster bracelet. 31mm stainless steel case, domed bezel, pink dial, Roman numerals, and Oyster bracelet. 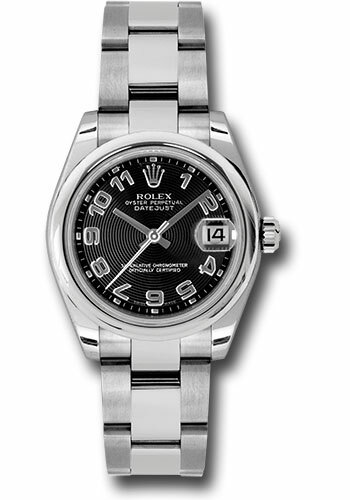 31mm stainless steel case, domed bezel, dark rhodium dial, floral motif, and Oyster bracelet. 31mm stainless steel case, domed bezel, silver concentric circle dial, Arabic numerals, and Oyster bracelet. 31mm stainless steel case, domed bezel, silver dial, Roman numerals, and Oyster bracelet. 31mm stainless steel case, domed bezel, silver dial, index hour markers, and Oyster bracelet. 31mm stainless steel case, domed bezel, white dial, Roman numerals, and Oyster bracelet. 31mm stainless steel case, domed bezel, white dial, index hour markers, and Oyster bracelet.